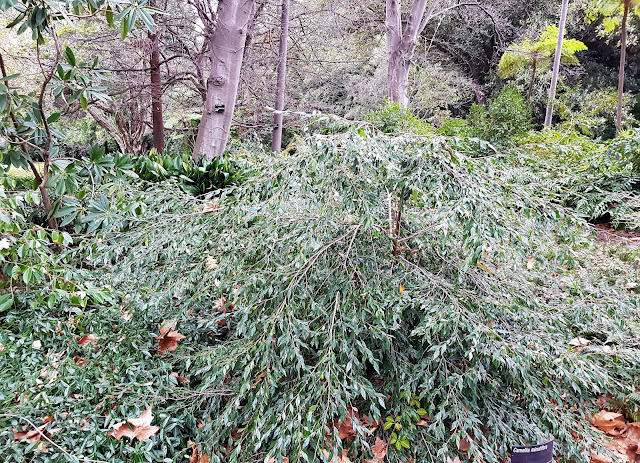 We've had a camellia collection at Royal Botanic Gardens Victoria for at least 145 years. Today we have (or once had) over 950 species and cultivars, with the entire collection recognised as a 'Garden of Excellence' by the International Camellia Society since 1996. Of course this badge of excellence doesn't mean we always get things right. I received a terse letter the other day from Camellias Victoria taking us to task over some of the names on our plant labels. And fair enough. 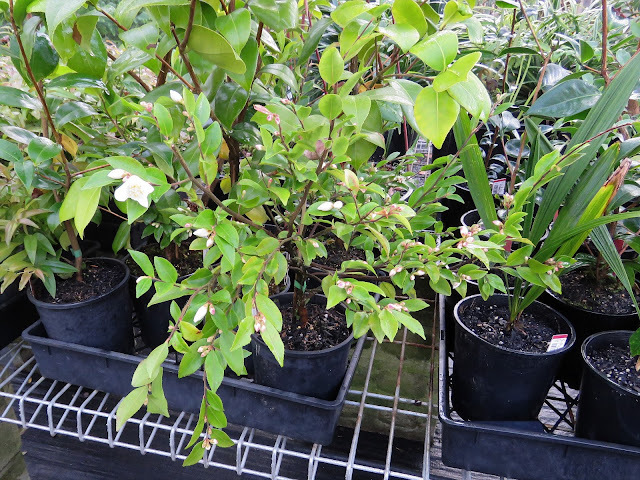 We had Camellia reticulata cultivars labelled as Camellia japonica - an embarrassing mistake! Plus a few others. So we will review all our display collection and replace labels as needed. Away from the public eye, in our nursery, we have a few specimens waiting to be planted out. I'm just hoping we have this one named correctly but I gather it is Camellia lutchuensis. It's also growing outside in the Southern China Collection, Camellia Bed and Rhododendron Bed. It's a cutie, with small leaves and small flowers, and pretty little buds. Not uncommon in cultivation but a species rather than a garden cultivar. It is also not uncommon in its natural habitat, in the southeast of China (including/plus Taiwan) and the Ryuku islands of Japan. Where things get a little hazy, and here I fear censure, there are two varieties: lutchuensis from Taiwan and Japan, and minutiflora from (the rest of) China. The latter was originally described as separate species, Camellia minutiflora, but is now considered a variety of Camellia lutchuensis. 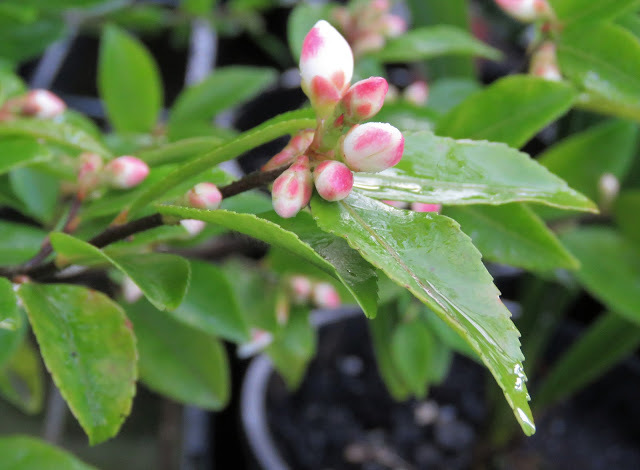 I wasn't sure originally which variety to apply to our nursery plants and assumed it would be minutiflora given most of our material from this region of the world was collected in mainland China. 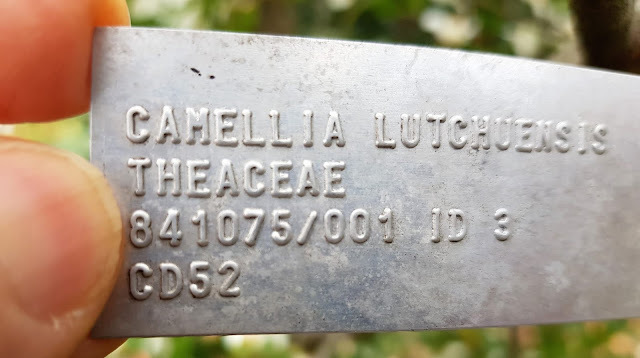 Then I discovered we have a couple of specimens planted out in the garden where they are labelled Camellia multiflora on the sign, and Camellia lutchuensis variety minutiflora on our database. This is a common misalignment, due to electronic data being easier and quicker to change than the plastic sign - and in this case the change is relatively unimportant given you can link the two names quite easily (there has been no change in the scope of the 'taxon'). 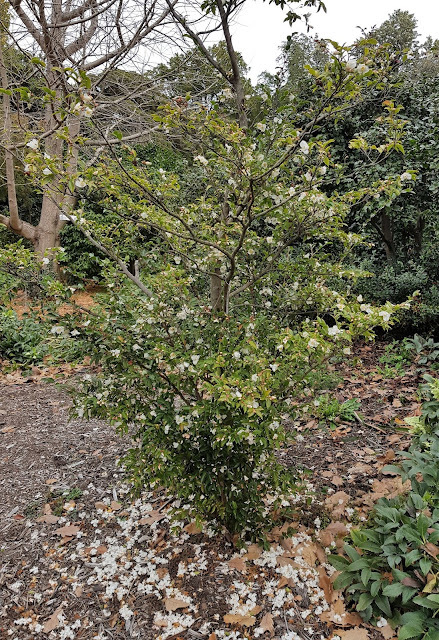 So I took a walk in the Melbourne Gardens and found both varieties, two in our Rhododendron Bed (which counter-intuitively perhaps, contains lots of Camellia species) and one across the path in the authentic Camellia Bed. The first two are minutiflora and in bud only (above and below). The third is lutchuensis and in full flower (like the nursery specimen). If you want to get all technical, the differences are in the hairiness of the small branches (more so in lutchuensis), leave shape and size (generally larger in lutchuensis) and in the size of the flower and flower stalk (as predicted by the name, smaller in minutiflora). 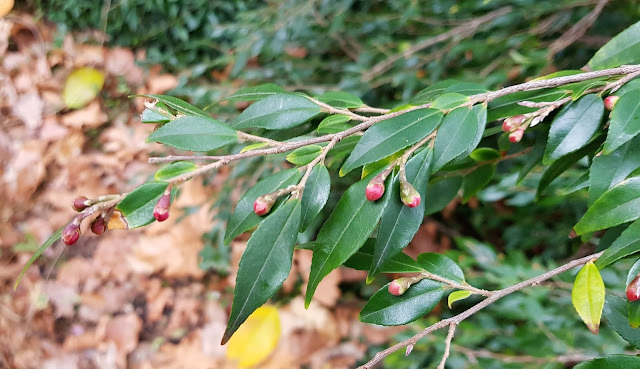 As a final check I looked up the source of the material of Camellia lutchuensis variety minutiflora, hoping to find a locality in mainland China somewhere, perhaps one of Royal Botanic Gardens Victoria horticulturist Terry Smyth's collecting trips. I had all the necessary information on this planting tag, including that it was introduced into our collection in 1984. 'ID3' by the way is good, meaning the name is pretty solid. Horticulturist Sandra Hodge happened to be at her computer in the nursery and did the necessary searching. Excitedly we waited for the details of 841075 to appear. A camellia nursery. In Noble Park. An outer suburb of Melbourne. With no details of its wild origin. Ah, well. 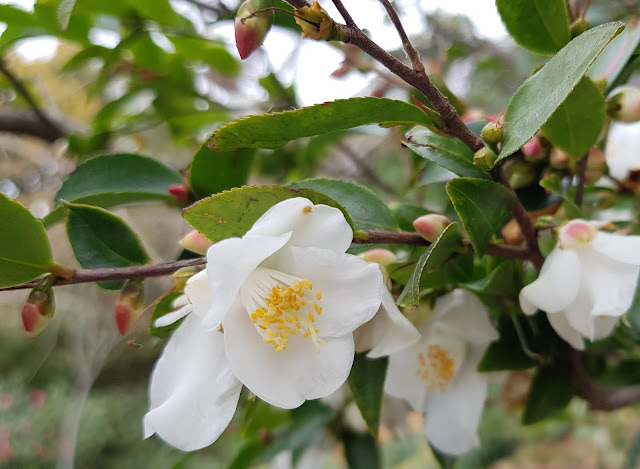 The flowers of this species are particularly fragrant - reportedly 'the sweetest scent of any camellia - and it has been hybridised with Camellia japonica (he says confidently) to produce popular, pleasantly perfumed cultivars. 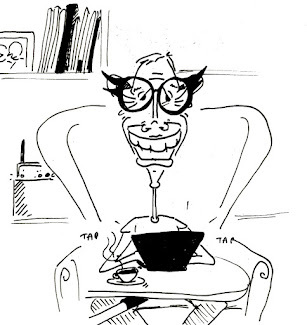 Sometimes the scent is described as like cloves. 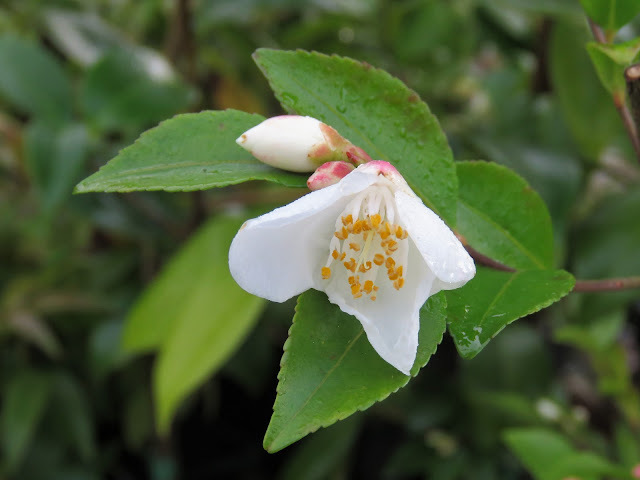 Let's just say, Camellia lutchuensis variety lutchuensis by any other name would smell as sweet.